Owen Farrell kicked a penalty two minutes from time as the British and Irish Lions claimed a dramatic 15-15 draw against world champions New Zealand at Eden Park. In doing so, a pulsating Test series also ended 1-1, with one Test drawn, as both sides fought themselves to a standstill. The All Blacks thought they had a chance to win it with just seconds left, but as Beauden Barrett lined up a kick at goal, referee Romain Poite consulted television replays and awarded a scrum to New Zealand instead for accidental offside. New Zealand looked to have silenced the Lions’ roar, but they were guilty of blowing a number of gilt-edged chances that ultimately returned to haunt them. The Lions’ hopes of series glory on New Zealand soil for a first time since 1971 were ultimately thwarted by an All Blacks side that made it 40 Tests unbeaten at Eden Park. The third Test decider did not disappoint, matching expectations in terms of ferocious intensity as both sides tore into each other. First-half tries from international rookies Ngani Laumape and Jordie Barrett gave them momentum, while Beauden Barrett kicked a penalty and conversion, with Farrell’s four penalties and an Elliot Daly strike providing the Lions’ points. The Lions were left to suffer frustration rather than create history, but it was a brave and resilient effort. Perfect playing conditions - dry and barely a breath of wind - greeted the teams, but the Lions conceded an immediate penalty when Warburton transgressed at a ruck, only for Barrett to drift a 45-metre chance well wide. It was a let-off for the Lions, yet still a concerning early development for them as Poite made his intention clear at the breakdown. And the initial All Blacks onslaught continued as they probed deep inside Lions territory before the tourists broke free and should have scored following sustained pressure, but Farrell’s pass was intercepted and it took brilliant defensive work from Jonathan Davies and Liam Williams to snuff out danger. New Zealand, though, were in no mood to waste the opportunity and they struck through a 15th-minute try after Barrett’s cross-kick found his brother Jordie, who tapped possession back inside and Laumape finished off. Barrett’s conversion made it 7-0 and it was a nervy opening from the Lions, not helped by Farrell’s error-strewn first quarter before he kicked an angled penalty to open their account. But New Zealand continued pressing and they should have scored again after shunting the Lions off their own scrum ball. only for Beauden Barrett to knock on his half-back partner Aaron Smith’s pass with the line beckoning. It was wasteful rugby from the All Blacks and the Lions finally released New Zealand’s grip when Davies put a crunching tackle on Jordie Barrett and gained a penalty, yet the Lions ran it and went straight into a dead-end. 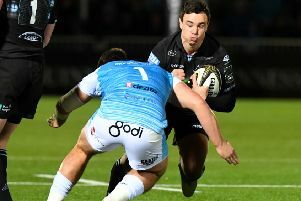 A second Farrell penalty narrowed the gap eight minutes before half-time before fly-half Johnny Sexton went down clutching his left ankle and was only able to continue following lengthy treatment. There was still time, though, for New Zealand to strike again as Laumape’s brilliant off-load to his midfield partner Anton Lienert-Brown caused sufficient havoc before Jordie Barrett finished superbly on an arcing run. Beauden Barrett missed the conversion, yet the Lions - given they had struggled for much of the opening 40 minutes - would have settled for only a six-point interval deficit, even if New Zealand had lost only one of 58 previous Eden Park Tests when leading at half-time. Lions flanker Sean O’Brien did not appear for the second period - he was on the receiving end of a crunching first-half collision - and his Ireland colleague CJ Stander took over. And the Lions made a dream start to the half when Daly, renowned for a mighty left boot, duly obliged by kicking a penalty from 52 metres out. The Lions then had another reprieve, this time when Jordie Barrett fired out a forward pass to unmarked wing Juian Savea, and the visitors were using up huge slices of luck yet still remaining in the contest. And they were further helped 10 minutes into the half when All Blacks flanker Jerome Kaino caught Alun Wyn Jones in the face with his arm and Poite showed him a yellow card after consulting television replays. Farrell’s third successful penalty levelled the game with 20 minutes left, raising hopes of a famous win and setting up a pulsating closing quarter as both coaches began unloading their replacements’ benches. And it was one of the Lions substitutes, Kyle Sinckler, who infringed 12 minutes from time, collapsing a scrum, and Beauden Barrett nudged the All Blacks back in front, which proved an advantage the Lions could not claw back until Farrell struck as the clock ticked down.